In June 1918, the artist Arthur Lismer (1885–1969) was commissioned by the committee of the Canadian War Memorials Fund (CWMF) to document the war effort at the home front in Halifax, a strategic stronghold for the Allied Forces, and to record the port of Halifax following the single most destructive man-made explosion prior to the development of nuclear weapons. The commission was part of an ambitious official war art program initiated by the Canadian-British businessman Max Aitken (later Lord Beaverbrook) that would involve some 120 artists, most of them British or Canadian, who would produce nearly 1,000 works of art. Harold Gilman (1876–1919), a major figure of London's Camden Town Group, was the only British war artist sent to Canada, where he was tasked to create a major painting representing Halifax Harbour during war time. Marking the 100th anniversary of the end of the First World War, the National Gallery of Canada’s exhibition Masterpiece in Focus: Halifax Harbour 1918 explores how these two painters-turned-war-artists approached their respective missions, the challenges of working during the aftermath of the tragedy and their roles during a critical moment in the history of Canadian landscape painting. Until 1916 Arthur Lismer had been working in Toronto where he had befriended the artists Tom Thomson, A.Y. Jackson and J.E.H. MacDonald, laying the foundations for the formation of the Group of Seven. With the outbreak of war, however, Lismer decided to accept the position of Head of the Victoria School of Art and Design in Halifax. Living in Bedford, some ten miles outside of the city, the artist felt the impact of the massive explosion that decimated large swathes of Halifax on 6 December 1917. The SS Mont-Blanc, a French vessel carrying 2.9 kilotons of explosives, collided in The Narrows with the Norwegian relief ship SS Imo, destroying much of the city’s north end and the Dartmouth region across the harbour. The resulting explosion killed nearly 2,000 people, injured 9,000 and left 6,000 homeless. Lismer witnessed the devastation first-hand at his art school where all the windows had shattered and the building was turned into a temporary storage facility for the wooden coffins required by the local undertakers. Having trained as a newspaper illustrator back in his native Sheffield, the artist decided to record the grim sights in a series of haunting sketches. “Only the snow was merciful,” he wrote in his diary, “I do not believe one could ever see again more deeply poignant, human scenes.” The CWMF commission expanded his effort, resulting in an oeuvre that ranges from sketches to paintings and a significant group of lithographs. Harold Gilman arrived in Halifax at the end of May 1918, and for the next four months this gifted draftsman produced a large number of pen, ink and watercolour drawings that would serve as studies for the painting, which he would complete back in London later that year. Gilman’s monumental Halifax Harbour – in the National Gallery of Canada’s collection – would be his most ambitious work and his last undertaking before his early death in 1919. In recording the cityscape and harbour he rendered his drawings with nearly obsessive attention to detail, at times mapping out each element across a grid of squares, which he would later use to transfer to the canvas at roughly five times this scale. Harold Gilman, Halifax Harbour, 1918. Ink and watercolour on paper, 33.5 x 54.5 cm. Gift of Mrs Harold Gilman (no.VAG 31.57). Collection of the Vancouver Art Gallery. Sharing a common mission, Lismer and Gilman would at times explore together the sights around the Bedford Basin to identify subjects of interest for their respective projects. For both artists, the War Memorials Fund commissions posed challenges that pushed the boundaries of their artistic practices. Gilman chose to depict a panoramic view of the harbour, approaching this motif with exacting preparation; Lismer was freer in his explorations, which resulted in a diverse body of work including drawings in graphite and ink, pastels and small oil sketches. He eventually produced three paintings and a set of sixteen lithographs that reveal his capacity for intense and meticulous focus. Interestingly, both artists chose to represent scenes away from the devastated areas and both were keen to represent Dazzle ships, vessels painted in a complex pattern of contrasting geometric shapes. This type of camouflage was used extensively throughout the First World War and, to some degree subsequently, in an effort not to conceal but to confuse the ship’s type, size, speed and direction of travel. For Halifax Harbour, instead of representing the site of the maritime catastrophe, Gilman replaced it with a glowing landscape to create, as he wrote, a “tranquil” setting. The sky’s rhythmic pattern and crisp green hills in the foreground further accentuate the artist’s desire to embed the dazzle ships and industrial factory buildings within the maritime landscape. Lismer focused on the activity on the water in and around the harbour. His canvas Winter Camouflage depicts a sweeping, tranquil view of the Bedford Basin. It is as much about the awe-inspiring maritime landscape with its snow-covered pines and cobalt-blue shadows, as it is about the camouflaged warships. In anticipation of the exhibition Winter Camouflage has undergone a conservation treatment, which has restored the painting’s high-keyed colour scheme. Here the artist revealed his aptitude as a landscape painter, drawing on European influences and in particular Northern Scandinavian art. The painting was very well received when it was shown at the Art Gallery of Toronto that year and immediately purchased by director Eric Brown for the collection of the National Gallery of Art that same year. The National Gallery of Canada’s focus exhibition follows the evolution of the paintings by both artists, from the original drawings, oil sketches and prints to the final paintings. These works reveal the artists’ methods of working, their calculated use of colour and their preoccupations in terms of subject and composition. Gilman created loosely rendered sketches alongside measured, cartographic-like studies and applied the most detailed colour annotations to serve as aide-mémoire. He would work through a set of drawings to then move onto larger scale oil sketches to further assess the colour scheme. Lismer, by contrast, would capture sweeping views and create lively, quick studies in calibrated colour and exacting patterns that hint at his innate understanding of the Canadian landscape and anticipate his landscape paintings with the Group of Seven. 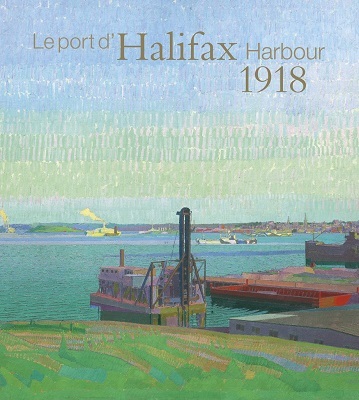 Whether depicting a small boat at sea, the return of soldiers or the imposing dazzle ships destined to cross the Atlantic, Gilman and Lismer show a profound sensitivity and deep commitment to recording Halifax at this troubled moment in history. In their exploration of the city and its surrounding landscape both artists not only gave expression to their particular artistic vision, they succeeded in creating works that are important markers in the evolution of landscape painting in Canada. Anabelle Kienle Poňka is the Interim Senior Curator of European Art. Explore a city in wartime, and one of the most searing events in Canadian history, through two iconic works from the National Gallery of Canada collection. Correspondence between Eric Brown and Arthur Lismer shows solidarity in the wake of disaster and Lismer’s utmost dedication to art.